Laurie was the youngest of my four children, born June 7, 1984, just after her father had left me for another woman. I often considered La my special gift from God to get me through the pain of divorce from a man I had loved deeply. From the moment she arrived, she was very much loved by her two teenaged brothers, Greg and Chris, and her big sister, six-year-old Katie. Our family grew again four years later, in 1989, when I married Pete, a wonderful man I had known for many years. Pete had a sweet four-year-old daughter, Kristin, who was with us on weekends and any other time we could arrange it. Laurie and Kristin, only five months apart in age, became stepsister twins. Much of the time together was fun and silly (sometimes filled with drama and jealousy)—mostly, we just loved being a family. Fast forward to 2005. Out of the blue, I got a call from my stepdaughter that Laurie had not shown up for an exam at an evening class they were both taking at the local junior college. I called her cell phone with no luck. Then I called her fiancé; he had seen her that morning but had not heard from her since three o'clock in the afternoon. Worry started settling in as I made more calls to friends and family. This was not like Laurie. She was pretty much an open book; she stayed connected with so many people at any given time. Ultimately, we went to our local police station that night and reported her missing. We feared an abduction or a horrible accident where her Jeep was deep in a trench and unseen. We endured three days of torturous, prayer-filled, media-immersed anxiety. The end came when her Jeep was found in the Chicago police impound with a suicide letter on the front seat. She had ended her life in the cold waters of Lake Michigan. Grieving the loss of Laurie was gut-wrenching. The very first holiday, just weeks after her funeral, was Easter. I assumed that, somehow, by having the family around us and soldiering on with the traditional Easter feast and celebration, I would get through this. Big mistake. Grief too fresh, no one really knowing what to say, not wanting to upset me, the gaping hole of Laurie’s absence—it was too much. Why did she do it? What was going on with her stepsister, Katie, drifting further and further in her relationships? What about the increased alcohol consumption among friends and family members? Ugh. We had to do something different to begin our lives without Laurie. Christmas has always been the favorite holiday in our family. I decorate our house from top to bottom: two trees, gingerbread houses, cookies, the works. And the mantel, beautifully decorated with garland, lights, and stars to shine down on the twenty-two Christmas stockings we hang. After the Thanksgiving disaster, I searched for some way to honor Laurie that first Christmas—some way to make her memory shine and not be stuffed away. I did not expect the total sobbing meltdown I had in Bed, Bath & Beyond. The last time I had been in that store, I was with Laurie, picking out furnishings and linens for her newly painted bedroom. We had laughed so much that day, only ten months earlier. As I thought of that, I started to tear up and moved into a vacant aisle. The crying started in earnest, and as I tried to get a grip on my frazzled emotions, I thought of a phrase Laurie often spoke: "Don’t let anyone rob you of your joy." I dabbed tissues at the puddles in my eyes and then saw—at eye level on the nearest shelf of clearance items—a gorgeous gold Christmas stocking holder that read "JOY so boldly, I knew it was meant for me. As I put the item in my cart, what to my wondering eyes should appear but a beautiful women's tool kit, labeled "Barbara K." Every tool inside had "Barbara K" imprinted or embossed on it. What? That’s me. I am Barbara K. To me, this was clearly God speaking through these inanimate objects, showing that He cared and knew my pain. He was giving me a tool box—not just a physical tool box, but a relational, emotional set of tools to carry me through this journey. There would be friends to help patch me up. There would be family to fill in the gaping holes in our hearts. And JOY! Bring on some joy, Lord. I need it. Together, we would use these tools in the hard work of grief. God was there for me no matter what. 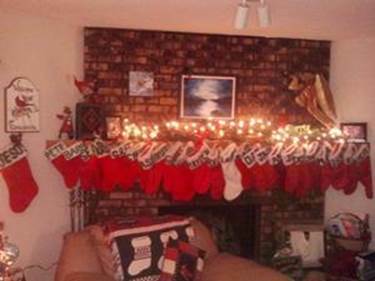 That year, I decided to change the red Christmas stocking with Laurie’s name to a fuzzy, white Christmas stocking. I hung hers right in the middle and stationed a small pad of paper with a pen nearby. As the family mix of grown children, grandchildren, siblings and spouses, nieces and nephews entered our home, I would quietly mention that there was a spot to spend a bit of time thinking of Laurie and her spirit. I suggested writing either a prayer or a note to her and stuffing it in her new stocking. That was all, and that was enough. Everyone at some point in that day made time to think of our girl. I loved it and treasure these notes to this day. And the tradition continues. The loss of our Laurie will never be understood. What I know, though, is this: she was loved beyond measure, and she loved us with her whole heart. Someday we will meet again on the heavenly shores.